It's been a minute. Life got really busy after Easter, and finding time to blog has been difficult. Here is what we have been up to. So, I guess the biggest thing that has happened was my change of jobs. I knew my first job in Portland wasn't the right fit since day one, and job-hunting for an ideal position similar to the one I had in Los Angeles was more time-consuming than I had anticipated. But, with patience, I landed a perfect position at an awesome company, and it's been even better than I imagined. I am so glad to be there! Word on the street is that home renovations always take longer than you wanted. Well, thats 101% true. Here we are, entering June, and besides my husband's studio project, putting a new toilet into our main bathroom, and painting one of the bedrooms, then turning it into an office, and now our bedroom, not much has physically has happened to our house. But, good news: demo for our stairs starts next week, so I will have some fun updates to share soon! The backyard: We have been making progress on our garden! When you move into a home in late fall/early winter, in a place that actually has seasons, you don't know what you have growing in your yard until Spring! But, back in March, I got antsy and we went to the nursery to buy a peony bush (because I have a backyard now, damnit). So, I bought a Coral Charm because they are my absolute favorite and duh. We planted it and were excited to watch it grow. Little did I know, our backyard was filled with peony bushes! Within weeks, tons of shoots started to sprout. I couldn't believe it! If we would've known when we first saw the house, I would've said SOLD right away. Now, we will never have to buy overpriced peonies at the store again! And I have tons to share! In additional to the peonies, our garden has also been sprouted tulips, four different color irises, tiger lilies are coming soon, and our apple trees are started to populate baby fruit for the Fall! Last weekend, I also felt like we needed more color and foliage, so I headed back to the nursery, and bought some fancy rose bushes on a whim. I mean, I actually don't love roses, but this is Portland so it seemed like a must-have. Since our backyard shares an exterior wall with our neighbor's garage (with the window looking into our yard), I thought it would be a perfect place to plant climbing roses. I really wanted to bring in some more vibrant colors to pop on the blue paint, so I got Pretty In Pink Eden roses. I can't wait util they start blooming and getting huge! It's going to smell heavenly out there! Lastly! We bought some cute patio lounge chairs from Ikea and it has made a huge difference! We love to sit outside and sip coffee in the mornings. But something was missing: A Fire Pit! 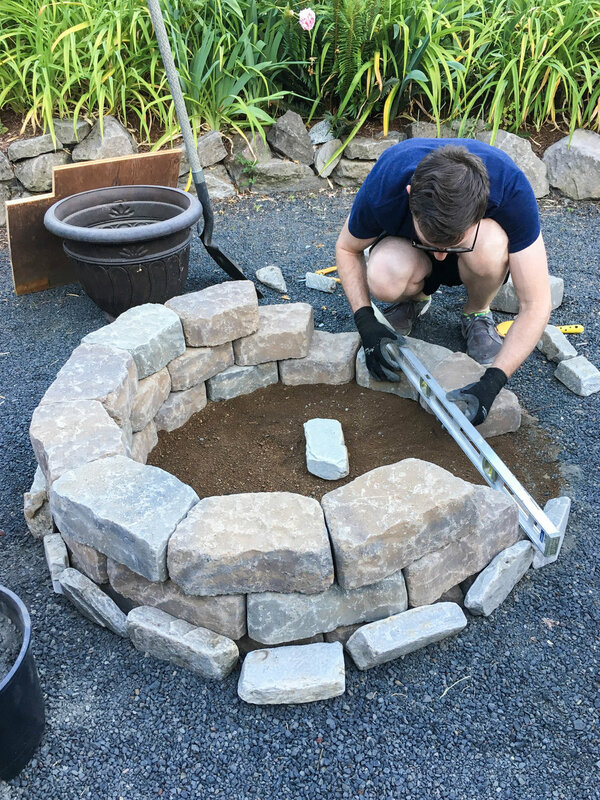 So, this past weekend, Danny and I jumped in the van and picked up a ton (literally felt like a ton) of masonry stones and built our very own fire pit! Should be up and running soon! I'm so excited to spend evenings out there! It's safe to say that our yard is turning into a magical garden. Travel has slowed down a bit due to house projects and my career change, but we have managed to get out and explore a little more of Oregon. Early Spring is tulip season and the Wooden Shoe Tulip Festival is where it is at! From seeing photos on Instagram I knew it was going to be beautiful, but it was more stunning in person than we thought. Tulips of every color literally went on forever! I definitely recommend stopping by here if you are in Northern Oregon around this time. Pro tip: bring your rain boots! It is VERY muddy! Then, our friends from Vancouver, B.C., came down to visit us in April and we headed to an area of Mount Hood called Rhododendron. We rented this super charming cabin in the woods that was vintage but cozy. Scattered with many hiking trails near by, we chose to tackle the trail to Ramona Falls. Roughly about 3.5 miles each way, we were faced with crossing a river by shimmying over logs and trekking through tons of snow! It was a pretty challenging hike, but making it to the falls made it worth while! I hope we can visit them again in the future! Steve came along, too, but he chose the luxury route - in a backpack on Danny's back! Look at these Canadian Cuties! And they are expecting August 2018! As part of my birthday gift back in January, Danny wanted to take me to this Alpaca Farm about an hour from our house in an area called Molalla! And man did we luck out: upon arriving for our tour, it turned out the others that were supposed to join were no-shows, so we got a private tour! Oh my god, they are so freakin cute! It's so funny how each Alpaca is so different from another, all with their own faces and personalities. Not only did we get to admire and learn about them, but we got to feed them, walk them, and pet them! It was so special. Thank you, Marquam Hills Ranch! And then somehow in the thick of things, Danny and I made it to Los Angeles for a weekend to celebrate his sister and dad's birthdays as well as Mothers Day. It was a quick trip, but we were able to pack in seeing our best friends and even went to my first metal show to see Behemoth. I am now a fan of metal. So, with blog radio silence came a lot. Time moves really quickly nowadays, and I know it's only going to move faster soon. It's crazy to think about what we were doing last year at this time, getting ready for our wedding, or two years before just having gotten engaged, and here we are now living in Portland taking care of our dog and working on our home. A lot can happen in a short amount of time, and I keep trying to remind myself to slow down and try to document and store memories before I lose them. I am also excited and looking forward to seeing where we will be another year from now.